If you’ve been out on a boat with a fish finder equipped, you’ll no doubt have admired how much easier fishing becomes when you have one of these marvels of technology with you. These amazing tools provide us with a ton of information on what’s going on beneath the waves, and when used correctly, can really provide a boost to our ability to catch monster fish. Not only can they tell us where the fish are and at what depth, but they can also tell us how deep the water is, what the temperature is and what the floor of lake or seabed looks like. As you can imagine, this is a massive advantage and take a huge amount of guesswork out of the fishing experience. If you want to know what the underwater terrain looks like, a fish finder can tell you that. If you want to know if there’s a sandbank, gulley or smooth bottom, a fish finder can tell you that. Traditionally, fish finders were limited to boat use only, but with the advent of portable fish finders, this is no longer the case. Bank, pier and kayak anglers can now use fish finders paired with their mobile phones. So, if you took your portable fish finder out on the ice into freezing temperatures, would it even work? Can I use a fish finder when ice fishing? Yes, you can use a fish finder when you’re ice fishing, however, you may need to perform a bit of setup and create a DIY solution. Versatile, wireless, castable fish finder for avid anglers, with an emphasis on shore fishing. Find fish and hot-spots faster. See fish location, their size and suspended depth as well as underwater structure, vegetation, bottom contour and hardness. Know water depth and temperature. Flashers: Flashers are very simple sonar based portable devices. At first glance, flashers can seem a tad confusing, with a simple readout with dials that change colour based on what it finds. Most flashers will tell you the depth of the water, if any fish are passing underneath and where your bait is. However, interpretation of this information based on what’s displayed does require familiarity with the tool and its usage. Traditional Fish Finders: When most people think of a fishfinder, they probably imagine something attached to a boat with an LCD screen showing what’s going on beneath the boat. The good news is that as long as you can safely remove the transducer and screen from the boat you can use it in an ice hole as well. The trick is to keep the transducer level and steady. Portable Fish Finders: Portable fish finders are a relatively recent innovation in the world of angling. These castable units have since made quite a splash and a big difference to anglers that are stuck to fishing from the bank or piers. They work by casting out a small transducer unit which wirelessly transmits the sonar data back to your smartphone or tablet. As you can imagine, these are quite well suited to ice fishing due to their portable nature. Will the Ice Damage my Fish Finder? Should I Have Multiple Holes When Ice Fishing with a Fish Finder? What is an Ice Fishing Transducer? We wrote a whole article on setting up your flasher for ice fishing, you can find it here. If you’re already lucky enough to own a boat with a finder, you’ll be glad to know you can use the fish finder for ice fishing as well. You will, of course, need to remove the transducer, cable and fish finding unit from the boat first. Next, you’ll need to create some sort of rig to keep the transducer level when it’s in the ice hole, there are a few options here, a custom made mount is probably the best option tailor-made for the model of fishing finder you’re using. There are a couple of additional challenges you’ll need to overcome as well, for example, how will you power the fish finder and will you need to create a 2nd dedicated ice hole just for the transducer? Also, depending on how integrated the fish finder is on your boat, removing it or adding it back to your boat could be a difficult task and may potentially be an expensive mistake to rectify if something goes wrong. For these reasons, boat fish finders are our least favourite option to use out on the ice. However, if you can get an inexpensive used boat fish finder, it could be a good option, as long as you can overcome the technical challenges that come with using them. Portable fish finders offer several advantages over boat fish finders when it comes to ice fishing. You will still be required to drill a second dedicated ice hole to place the finder into, however, the rest is fairly straightforward. Attach the portable fish finder to a line or rod as would normally, wirelessly connect it to your phone or tablet and then place it in the ice hole. Once all of this is done you should begin to receive readings back of what’s going on underneath the ice. There are a couple of things to look out for so you don’t end up losing or damaging the portable fish finder. Make sure the ice hole doesn’t freeze over with the fish finder still in it, trying to remove it from solid ice is not an easy task. You’ll also need to make sure it doesn’t get swept under the ice sheet, a line will help avoid this, but check on the fish finder regularly. Lastly, make sure the hole you’re drilling is wide enough so that the ice sheet doesn’t impede the sonar of the transducer. If you see a lot of noise or false readings on your phone, then the ice sheet is likely causing interference. In most circumstances a fish finder will not be directly damaged by freezing temperatures, however, the biggest risk to your equipment is if the transducer or portable fish finder is frozen in place. This doesn’t represent a situation that can’t be rectified, but it can be difficult or awkward to free equipment from ice. The other dangers presented is if moisture has worked its way into any surface cracks or joints, if that has occurred and the water then freezes, this can cause further damage as the ice expands. The LCD screens on most fish finders are not meant to be submerged, so it’s a good idea to keep these as dry as possible. If you find that your fish finder stops working suddenly for no apparent reason, then wipe it down and get it back to a warm area as soon as possible. It’s possible the cold temperatures have adversely affected the batteries or the electronics, so warming the unit up should get it going again. Most of these scenarios are unlikely to play out unless you’re ice fishing in extremely cold weather or you’re exposed on the open ice without an ice shack. As long as you bear in mind that fish finders are electronic items that are not immune to environmental factors, then you should be absolutely fine. Make sure you inspect the units for any damage before exposing them to water and treat them well and they should see you through even the harshest of winters. Firstly, we don’t recommend removing your fish finder from your boat, it can be a lot of work and can potentially cause damage to expensive equipment. However, if you’re absolutely sure that this is something that you want to do, then make sure you think clearly about and accurately record where everything was located. Generally speaking, it’s much easier to take something apart than it is to put it back together. The first and easiest step is to remove the fish finder screen from its mounting bracket. We would suggest buying a new set of brackets if you’re looking to mount the screen when out on the ice rather than removing the originals from the boat. The next part is much harder to do and requires some serious planning, you’re going to want to trace the wiring through your boat to the transducer. Most of the time the transducer will be mounted on the underside of the boat near the rear, and it may or may not be easily accessible. Depending on how its attached to the boat you might be able to simply undo a few screws and the transducer, as well as the wiring, might just come away. On more complicated setups, the transducer might be firmly integrated into the hull of the boat, so removing it might be challenging. A much easier option might be to buy a secondary compatible transducer to use with the LCD unit. This could save you a huge amount of work in the long term which is something you might be thankful for when it comes to adding the transducer and wiring back on your boat for the 3rd year running. Yes, you should absolutely have multiple holes when your ice fishing with a fish finder. The reason for this is very simple, you’ll want to disturb your fish finder as little as possible. Any additional movements imparted to your fish finder by the act of fishing can and will affect what it shows on the screen, so you can easily avoid this issue by drilling a dedicated fish finder hole. Start by drilling any holes you might want to use for fishing, this can be one, two, three or more. Next drill another hole as wide as you can make it, this will be used as our dedicated fish finder hole. Place the transducer into the hole and check to see what kind of reading we’re getting on the screen. If the reading is clear then you can mount the transducer on something stable so that it doesn’t move around, if you’re using a portable fish finder you can skip this step. You may need to adjust the gain or fine tune the fish finder settings so that you’re getting a good read of what’s going on beneath the ice. Once everything is clear and accurate then you can start the fun part which is the actual fishing. If you’ve set everything up correctly then you should be able to see your bait or rig in the water as you fish. Ice fishing transducers are in many respects similar to any other transducer. They attach to the fish finding unit are lowered into the water to broadcast and receive sonar for the purposes of detecting what’s going on beneath the surface of the water. The key differences are that ice fishing transducers have a wider beam, they’re more portable and that they are insulated to withstand the cold. Most are insulated with a layer of silicone and they tend to have a more flexible design with a smaller overall footprint so as to improve portability and ease of use. 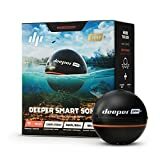 They work in the exact same fashion as a regular transducer, in that they are connected to fishfinder display. The transducer will then produce a sound wave which will propagate through the water, as the sound wave encounters objects such as fish and rocks, a portion of the wave is reflected back at the transducer. The transducer will receive and pass the reflected sound wave to the fish finding unit where it’s processed and used to build up a picture of what’s happening beneath the ice. Using the time between broadcasting a soundwave and when it’s received back the fish finder can calculate distances as well as the density of an object. More advanced models can use triangulation and advanced mapping techniques to create a 3d underwater picture, which allows greater accuracy and control over the fishing experience.